Yesterday I made Mark Bittman's Pork Pernil. It's an easy recipe, but cooks pretty much all day. 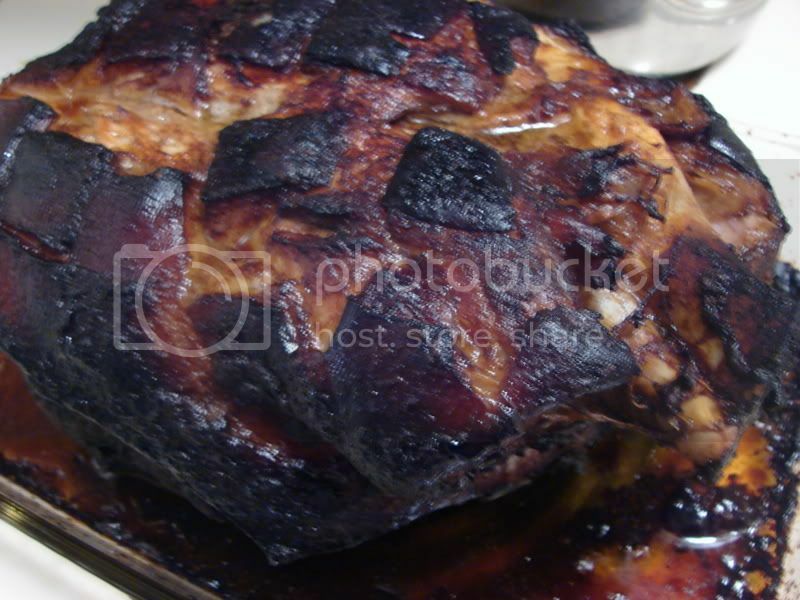 I had a big pork picnic roast, and it just sat in the oven and cooked away for 5 hours or so. The results? Delicious, rich, tender, stick to your teeth pork. Warning, The whole onion in a food processor thing is heck on the eyes, and we had to open all the windows as the pork first went into the oven...very strong. Of course, the onions became a dark, sticky sweet flavoring for the pork as time went on, so it was worth the tears and briefly cold home. 1. Heat oven to 300 degrees. Score meat's skin with a sharp knife, making a cross-hatch pattern. Pulse garlic, onion, oregano, cumin, chili, salt and pepper together in a food processor, adding oil in a drizzle and scraping down sides as necessary, until mixture is pasty. (Alternatively, mash ingredients in a mortar and pestle.) Blend in the vinegar. 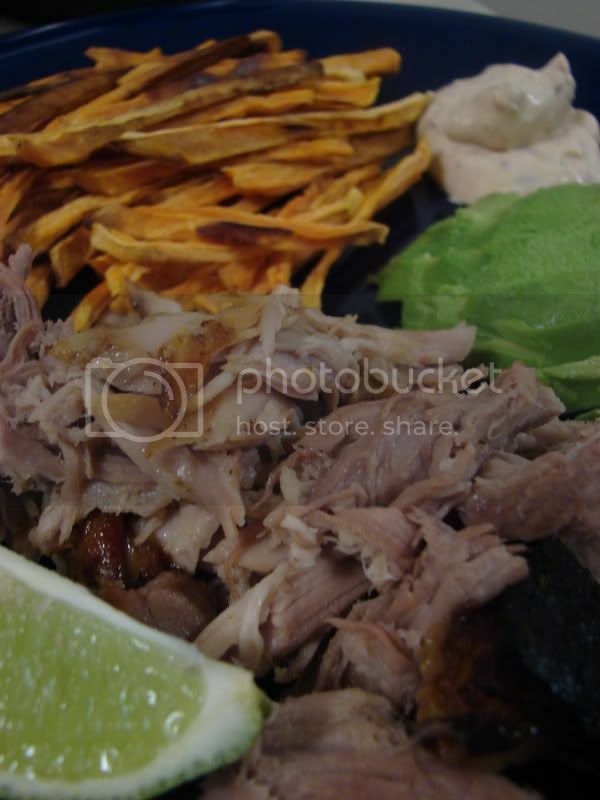 Although I could probably just eat a big plate of this pork, I decided to make some sweet potato oven fries to go along with it. I've never been able to get crisp sweet potato fries in the oven, but I saw this recipe from Molly Katzen on Serious eats, and thought I'd give the method a try. Basically, there are two tricks...really thin fries and some time in a low oven...It worked pretty well...most were crisp, but those that weren't were kinda tough. 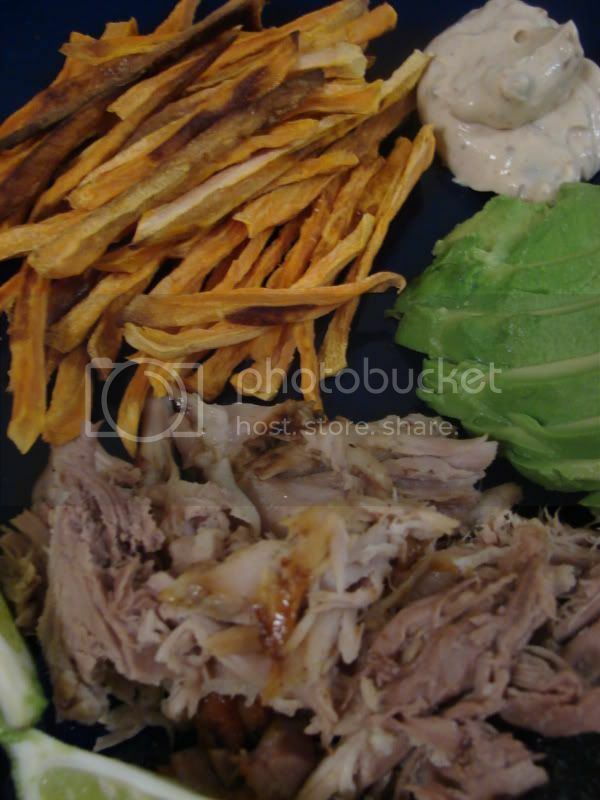 I mixed some canned chipotles into some light sour cream as a dipping sauce...chipotles and sweet potatoes are one of my all-time favorite flavor combos. To add some green to the meal, I simply sliced up some lovely ripe avocados. I had a baggie of sweet potato scraps, because cutting the skinny fries was kinda hard and there were a lot of rejects. I boiled those and mashed them with some of the chipotle sour cream. 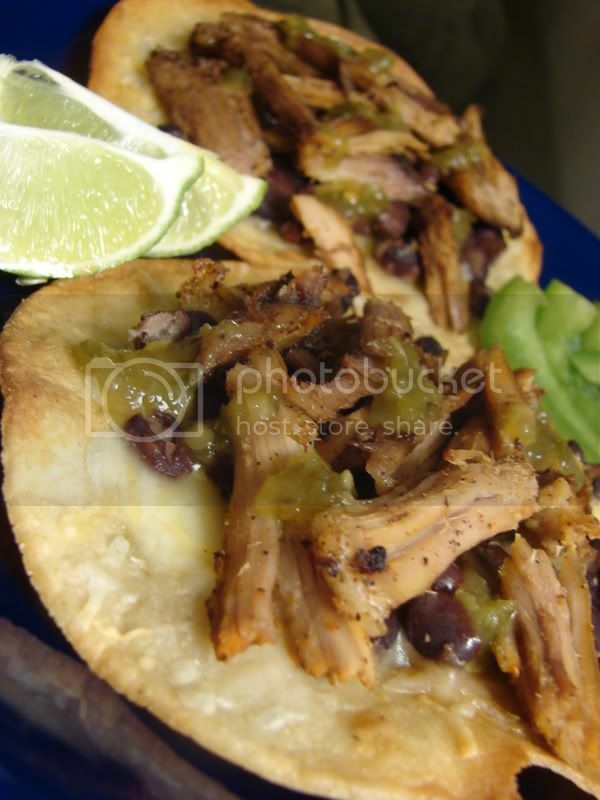 spread the mixture on a corn tortilla, added warmed up pork along with some fixin's and had a really lovely tacos! 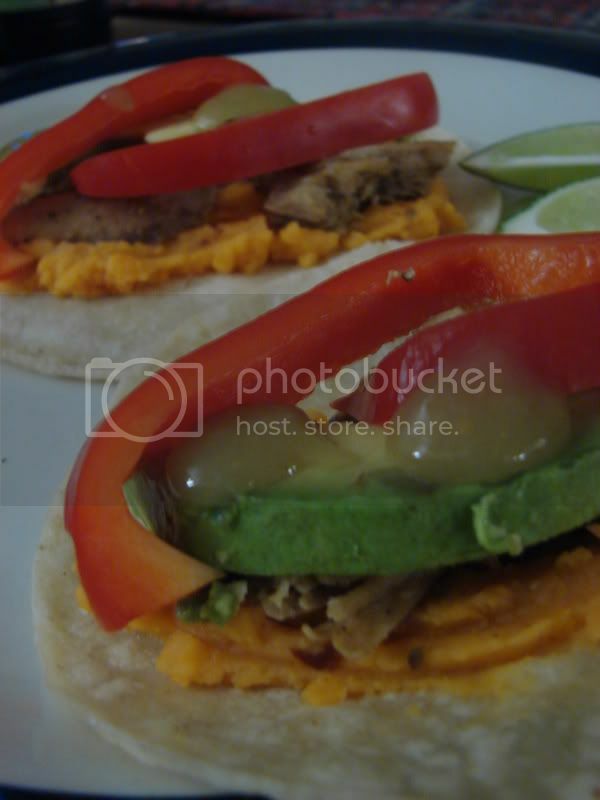 Mashed sweet potatoes on tacos? YES!! EDITED AGAIN: More leftovers! This time I made sort of...toastada? I fried up some corn tortillas, topped them with cheese, seasoned black beans and the pork and put them in the oven until the cheese was all melted. Topped it with green salsa and lime juice. Crunch cheesy porky goodness! ONE LAST TIME EDIT: The last of it! That's right, I just used up the last of my leftover pernil! I kinda thought it would last longer, but there must have been some random snacking from the fridge here and there *ahem*...anyway, I whipped up a curry with it tonight. No recipe, of course...that's how it goes when I decide to make a curry with leftovers and pantry items. I started with sauteeing grated fresh ginger and garlic, diced shallots, halved pearl onions and thinly sliced green chili in oil, then once that started to soften I started dumping in lots of spices, before adding the pork. Lots of curry powder, some turmeric, ground ginger, ground clove, cinnamon, chili powder, garlic powder, onion powder, fresh black pepper, red pepper flakes, more curry powder more cinnamon and so on. I just kept tasting and adding. I also put in a can of diced tomatoes, with juices, and some canned kidney beans, as those were the only legumes I had on hand. Also a good squirt or two of honey. When I needed more liquid for it to simmer, I poured some of the Leinenenkugels Sunset wheat beer that was keeping me company. 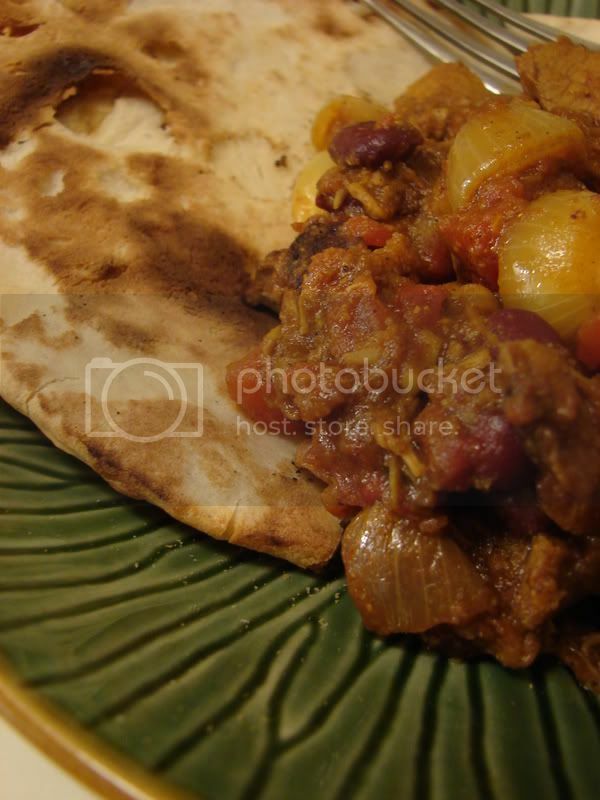 It's flavored with orange and cardamom, so the flavors meshed well. That's about it, I think...oh, some rice vinegar got put in there because it was missing a bit of twang. It's good. A nice, almost fruity and floral sweetness at first, followed by the slow heat. The end of my pork pernil. the end of an era? I love you comment about stick to your teeth!! Now that's what I'm talking about. Great job...next time invite people over.